El Caracol is sometimes referred to as “the observatory.” To modern eyes, the rounded dome of El Caracol—actually the decayed remains of what was a cylindrical structure—looks a lot like it could house a telescope. It doesn’t, of course, but there is plenty of evidence suggesting that El Caracol was used as a lookout on the heavens. In the Yucatan, dense with trees and scrub brush and flat as a tortilla, sky-watching of any kind is impossible without some way to rise above the leafy canopy. 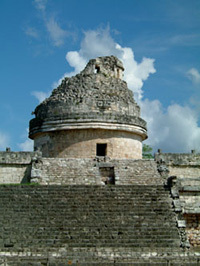 The tower atop El Caracol sits high on a four-cornered but not quite square platform and gives excellent unobstructed views of the skies and surrounding landscape. In particular, El Caracol seems to be carefully aligned with the motions of Venus. 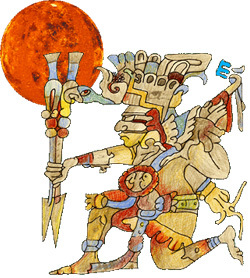 Venus had tremendous significance for the Maya; this bright planet was considered the sun’s twin and a war god. 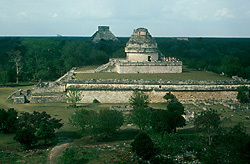 Mayan leaders used the changing position of Venus to plan appropriate times for raids and battles. The grand staircase that marks the front of El Caracol faces 27.5 degrees north of west—out of line with the other buildings at the site, but an almost perfect match for the northern extreme of Venus, Venus’s most northerly position in the sky. Also, a diagonal formed by the northeast and southwest corners of the building aligns with both the summer solstice sunrise and the winter solstice sunset. See a map of building alignments.